The Pro-Celebrity Challenge will see stars of TV, music and sport team up with the Grandmasters and face off against another pro-celebrity team. Games will be played with 10 minutes and 10 seconds on the clock and broadcast live. Lawrence Trent and Malcolm Pein will officiate. Each winning team receive £5000 for their favourite charity. Edgar Davids: Dutch footballing legend whose club career took him to Ajax, Juventus and Spurs, and included 74 international caps for Holland. His dreadlocked hair and protective goggles made Davids one of the most recognisable players of his generation. Alex Zane: Alex is an English television personality and DJ best known for presenting Rube Tube on Channel 4. 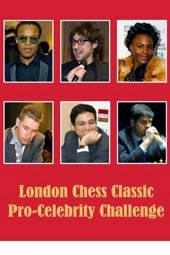 Alex was a guest at the 2010 London Chess Classic. Shingai Shoniwa: Singer and bassist for the Noisettes, an English indie rock band from London who are best known for the single “Don't Upset the Rhythm (Go Baby Go)”. 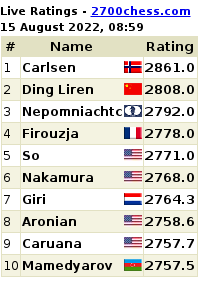 Lots of chess events happening at the London Chess Classic 2013: Check out their website. Chess could help Indian parents heave a sigh of relief about their children being hooked to social media. Grandmaster Boris Gelfand, World Chess Championship Challenger 2012, has said he believes chess is the solution to many of the technology fixated modern generation. “The ability to concentrate, focus, think ahead, respect rules and devote yourself to one thing and think deeply — these are all things which are missing in society but which chess has in abundance,” says Boris Gelfand. He was speaking to The JC.com. According to the 2012 World Chess Championship Challenger, Jews have historically excelled at the game because it was firmly embedded in the life and traditions of the communities of Eastern Europe. He himself is from Belarus. Jewish children played the game as part of an essential element of their intellectual development. Far from being elitist, he argues chess is the people’s game. “It is low cost. Even if you are poor, you can play without expensive equipment. 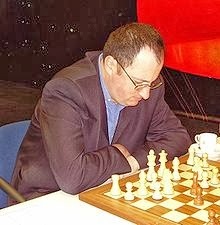 Gelfand is visiting the UK this weekend to take part in the London Chess Classic tournament. He is also here to promote the Charity Chess in Schools and Communities, which aims to get more primary school pupils playing the game. The chance of a lifetime: World Chess Champion and World`s Number 1 chess player, Magnus Carlsen, will hold a simultaneous exhibition hosted by Nordic Semiconductor during the CES 2014, where Carlsen plays multiple games at a time with 20 other players. A Nordic Semiconductor press release states, "We invite you to participate in this competition where you have the chance in your lifetime to be one of the lucky twenty that will play one of the most brilliant brains living today. Along with the honor of playing the number 1 chess player in the world, you will be rewarded with a signed chess board among other prizes." The skills required are not higher than just another hobby player. To participate answer a few simple questions and solve an easy chess puzzle. The lucky winners will be noticed well in advance. Closing date for entry is December 19, 2013, 12:00:00 PST. 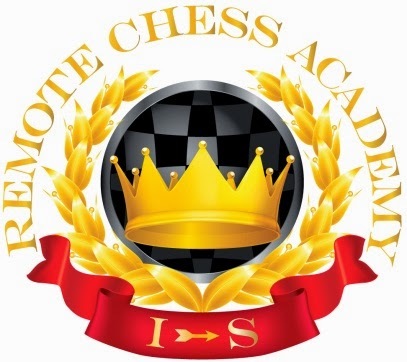 Enter the chess simul entry contest at the Nordic Semi website. Magnus Carlsen took ​​the honorary kick off for the Real Madrid-Valladolid match (The Norwegian, who became world chess champion on 22nd November, turns 23 on Saturday, December 30, and received a shirt and watch as a gift from President Florentino Pérez). The World Chess Champion was personally invited by Real Madrid president Florentino Perez. 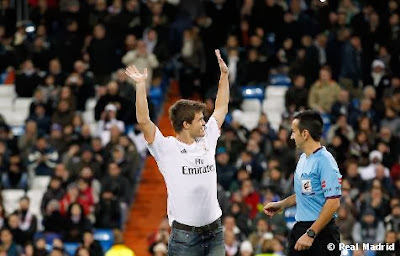 Magnus Carlsen is known as a Whites fan, took the honorary kick-off in the La Liga match between Real Madrid and Valladolid. The Norwegian, who is the second youngest champion in the chess history after Kasparov, received an ovation from the Bernabéu after winning the title by beating Viswanathan Anand, also a Real Madrid supporter, in Chennai (India). The World Chess Champion wore a Real Madrid shirt with 'Magnus' printed on the back. The home team won the match 4-0 with three goals by Gareth Bale. "It was super cool, it was great for a football fan," said Carlsen to the Norwegian newspaper VG in the Santiago Bernabeu stadium in Madrid, late Saturday night. "I had planned to stay home and relax, but this was something I could not say no to." Try this chess challenge from the 12th Women's World Chess Champion, Chess Queen™ Alexandra Kosteniuk herself. Writing on her blog www.chessqueen.com, GM Kosteniuk says, "I was teaching my daughter how to train moving the chess knight across the board as fast as possible, and she asked me to show how to do it fast. I recorded a short video about how I can do it in about 3 seconds (with slow motion). If there is anybody out there who can do it faster, I’m glad to announce that Chess King has offered several prizes to anybody who can do it faster than me. So practice your knight’s moves and speed, and send me by email the result (video or link to video), and you may win a prize! Good luck!" Come on India, we are sure some talented Indian chess players can crack the 3-second limit for the chess knight's tour of the chess board! In the scene, Wali beats Badey Sahab in the game, quite a signal that he is going to beat the feudal lord and the restrictive traditions of the region. In fact, Wali has already shown that by resolving the sugar mill dispute he is "playing things" his way... playing to win. 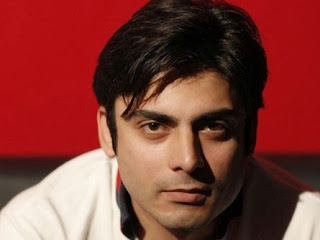 Fawad Khan excels in his portrayals of a range of characters. He has brought special charisma and glamour to the Pakistan television industry. As Fawad Khan has developed as an actor, his hard work and dedication has become obvious for all to see. It is both inspiring and infectious. By the way don't forget to wish Fawad Khan a very happy birthday today, November 29 on the official Facebook Page of Numm. You can also watch the previous episode there. Fawad Afzal Khan rose to prominence playing the role of Hassan in 2010 serial Dastaan for which he won Pakistan Media Award for Best Actor. Since then he has starred in a number of Pakistani serials, notably Akbari Asghari, Kuch Pyar Ka Pagalpan, Humsafar for which he won Lux Style Awards for Best Actor in 2013, Ashk, Zindagi Gulzar Hai and Numm. Khan made his film debut in 2007 with Shoaib Mansoor's Khuda Kay Liye which was the highest-grossing Pakistani film of 2007. Khan went on to win the Lux Style Award for Best Actor. In 2013 Khan appeared in Abdullah Kadwani's Armaan, which earned him Tarang Housefull Award for Best On screen Couple with Aamina Sheikh. Khan was first known for being the lead singer of Pakistani rock band Entity Paradigm, but the band split up due to life commitments. His songs "Shor Macha" and "Rahguzar" did well in the charts, and was considered a critical and commercial success. 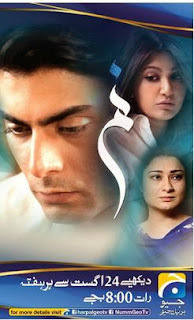 Numm (Urdu: نم‎) is 2013 Pakistani drama serial that portrays social issues. It is Directed by Ahson Talish, produced by Amjad Hashmi and written by Myra Sajid. The show tells the story of strict customs and rituals of feudal and its impact. The plot revolves around three people Fawad, Sania and Kanza, which shows the effect of unwise traditions and old customs on this triangle relationship. Numm was on-aired on August 24, 2013 worldwide by Geo TV. Before releasing Numm teaser trailers were leaving very deep impact on people, the serial become the most watched serial due to his highly and acclaimed TV starlets cast. Ahson Talish also acted in small scenes as a male protagonist (Fawad Khan) father. The theme song of the drama is also gaining huge popularity among fans and viewers. Currently it is one of the highly rated and most watched serials on Pak television. Fawad Khan will be seen in a lead role opposite Sonam Kapoor in the Hindi re-make of 1980s Hrishikesh Mukherjee film Khubsoorat. The film tells the breezy tale of an extrovert – a feisty girl (played by Sonam) who brings about changes in the regimented atmosphere of a household controlled firmly by its overbearing matriarch, according to apunkachoice.com. While Sonam plays the motor-mouth, Fawad will expectedly play the bachelor who falls for her. We cannot wait to see the on-screen chemistry between these absolutely gorgeous people! Rumour has it that Alia Bhatt was chosen to play the female lead but has now been replaced by Sonam, according to Oye! Times. If you happen to be in Geneva, Switzerland on December 8 at 2 PM, come and meet me or even play with me in a 30-player simul at the yearly Geneva Telethon, which collects money to support research to cure people from genetic diseases. 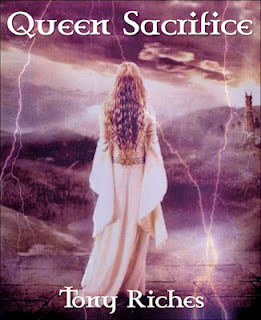 You can read the announcement on the 12th Women's World Chess Champion personal blog at www.chessqueen.com. Read the details about the tournament and sign up here. * This is a blitz chess tournament in honour of the Anand - Carlsen World Chess Championship Match. The basis for success in chess is to keep the right balance between learning, practice and fun. During the World Chess Championship Match, which started on November 9, you have the opportunity to learn much. But you need not just be a viewer! RCA Chess Open2013This will be a 13-round Swiss tournament, played with 3 minutes + 2 seconds increment per move. It is open to anyone – no serial number for playchess is required (free entry). All you have to do is download the client on to your machine, create an account and play in the event. 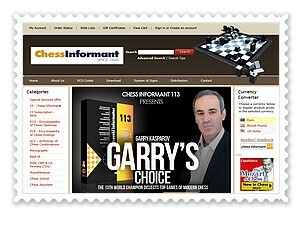 For details, see http://www.playchess.com. Here you will find instructions on how to download the software and create an account. The event is a human-only tournament. It is forbidden to use a computer, especially an engine, as help for finding your moves. All games will be controlled and strictly monitored for engine use. In order to improve your competitive mood, we are offering some attractive prizes, worth approximately 3,500 USD. Luckywins for places 35, 45, 55, 65, 75, 85, 95, 105, 115, 125, 135, 145,155, 165, 175, 185, 195 and 205: 3-month classic membership. The sign-up link again: sign up here.